Dumfries was proclaimed the best large town in Scotland 2018 and is hosting the Awards for Beautiful Scotland 2019. NB Our Dining Directory and Must Do & See in D&G guides are available from VisitScotland on the Whitesands and many other outlets including B&B's. 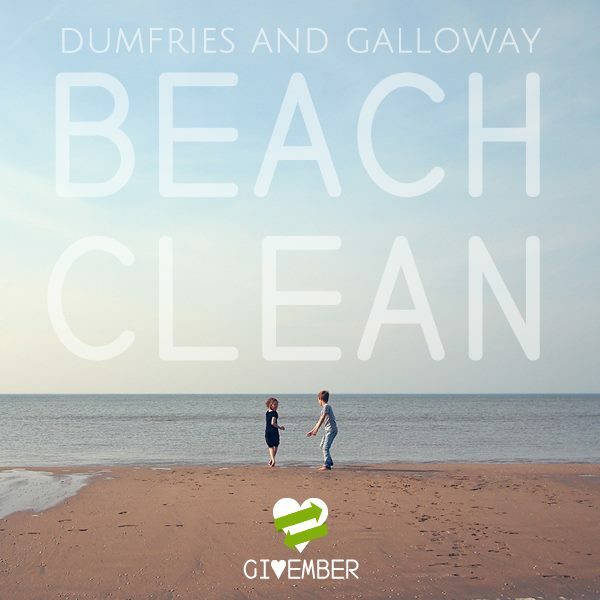 Being a coastal region we figured that one of the best ways to give back to the environment in November and December was by cleaning up the beaches. Rather than leaving the piles lying at the high water mark for the next winter storm to take it back out to sea, please take your rubbish away with you! Get a group of friends together to join in, or even just as you're taking a stroll. A little bit of effort goes a long way. 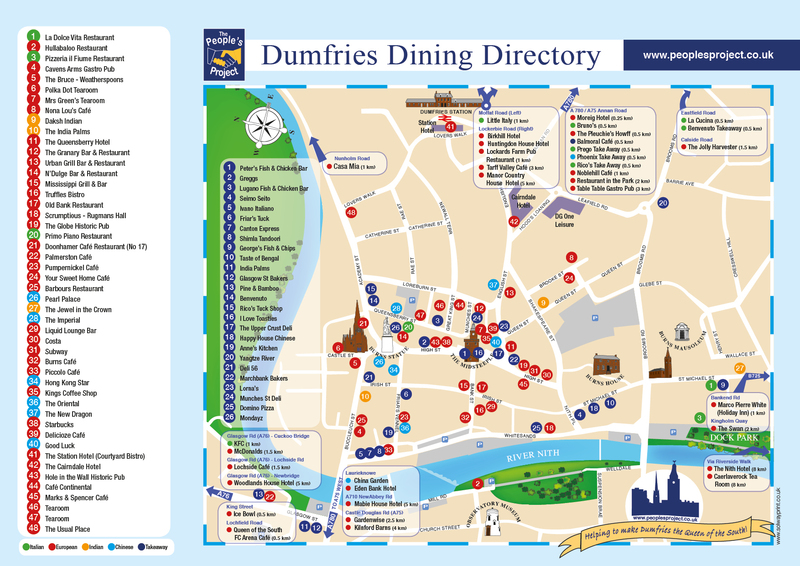 Below is the Dumfries Dining Directory providing you with a choice of eating establishments in the regional capital and on the periphery of the town. Planting of 150 fruit trees took place on the 25th November 2014. Up to 80 volunteers took part from local schools and residents as well as from Allanton Peace Sanctuary. Above is the Centenary Field that was planted in memory of the soldiers who gave their lives in WW1. The photograph was taken in June 2015 after having to be re-planted due to vandalism. You can now donate quickly and securely using Paypal or your debit/card card. HRH The Princess Royal officially opened the Queen's Diamond Jubilee Sculpture on the 9th of July 2013. "Robert Burns' Rock" was designed by local artist, the late David Gulland and carved by local stonemason David Little. Above: Joanna Lumley opens the Peter Pan statue at Garden Wise in Dumfries in 2011, and then in 2013 HRH Princess Anne addresses the crowds beside Robert Burns' Rock. The designer David Gulland is the third person to the right of the Princess. Tragically, Mr. Gulland died just elven days after this opening ceremony. the "me culture," - the selfishness and the blame, - and instead consider what we might be able to offer our town, - our region, - our country and ultimately our world. - and that meaning might be simply being of service to our community. Be different in your thinking, - dismiss thoughts of blame, - and be brave enough to make a difference. Take litter for example: - Almost all of us blame our council's for the mess, - but the reality is that the solution lies in our own hands! 90% of the litter adorning our streets is cleaner than the average door handle or railing, - so don't leave it there, - pick it up and find a bin! THE PEOPLE'S PROJECT IS FOR EVERYONE, - NOTHING IS IMPOSSIBLE, - IF YOU HAVE A DREAM, - WHY NOT MAKE IT A REALITY BY STARTING YOUR OWN PROJECT? Many of the world's problems are caused by greed and avarice, - equally, - in Dumfries and Galloway, - some problems could be solved by giving and sharing. Can you spare a little money to serve the good of humanity? To use the analogy of the loaves and fishes, - the five thousand were fed by sharing the available food equally. The People's Project aims to help and support the whole of our local community. This is not about personal empire building, - but all about sharing. Through community involvement we aim to crown Dumfries and Galloway "The Queen of the South"
"Essentially, - I'd like the public to embrace the PP; for them to realise that this is their opportunity to make a difference to their communities. We're all happy to raise money for good causes all over the world, - and that should obviously continue, - but sometimes charity should begin at home, - for the benefit of everyone." IT'S NOT ABOUT WHAT YOUR TOWN (AND REGION) CAN DO FOR YOU, - BUT MORE ABOUT WHAT YOU CAN DO FOR YOUR TOWN AND (REGION). "I PASSIONATELY BELIEVE THAT A STRONG REGIONAL CAPITAL, - BRINGS CAPITAL TO THE ENTIRE REGION."